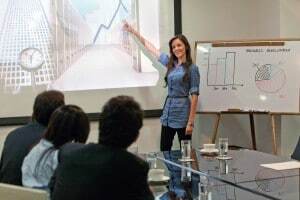 1) Designing a “PowerPoint Presentation”: Remember, a presentation is a verbal communication to your audience that may or may not use visual aids. PowerPoint is just ONE type of visual aid that can be used to further explain or clarify your presentation. If you focus entirely on this one type of visual aid without putting an emphasis on what you are actually saying, your presentation will tend to have a disconnected flow and will be difficult for the audience to follow. Instead, design your presentation and get good at delivering it first. Once you get good at delivering the presentation, then decide what visual aids you might be able to use to help you clarify your points. 2) Too Many PowerPoint Slides: Another big mistake is creating too many slides and using them as a crutch to make sure that we don’t forget anything in our presentation. Slide… Click… Slide… Click… Slide… Click… is a very boring way to deliver a presentation and makes the presenter look unprepared and uninformed about his/her topic. Only add a slide if it helps you better clarify your point. 3) Too Much Data on Your PowerPoint Slides: Your slide deck should be a visual aid to help you explain your point, so if you put too much data on a slide (too much text, too many numbers, or charts and graphs – gasp… Is he saying we can’t use charts and graphs?) you will overwhelm you audience. Your PowerPoint slide should convey a simple concept at a glance. A good rule is what we call 6X6, which means to limit your number of words per line to six and limit your number of lines to about six as well. 4) Overuse of Animation: PowerPoint will do some really cool types of animation, but remember that if you animate something, it should help you clarify your point. Bullet points that fly in, spin around, make sounds, and blink are just a distraction from your message. If you want your audience to follow you step-by-step, you can reveal your bullets one at a time. However, you’ll have more energy as a presenter if you just make your slide appear and physically move to your screen and point to your bullet point when you talk about it. 5) Too Many Busy Charts: (Gasp… He is saying not to use charts and graphs.) For the most part, charts, graphs, and pictures make terrible PowerPoint slides. If the charts or graphs are simple, they can be judiciously used in a slideshow, however if you are graphing total revenue of five different divisions on a quarterly basis for each of your ten major product lines, your graph will be way too busy to understand in a slide. Use a handout instead. If you need a visual aid for it, make a big poster of the graph but in most cases, you can just use the handout itself as the visual aid. 7) Not Practicing Your Presentation with the Slideshow: Time is getting short, so you send your slide deck to marketing to jazz it up a little. They send you the final copy minutes before you go in front of the group. Everything is perfect in the slideshow, but because you haven’t practiced, your flow is off, and you have to keep clicking the next slide before you start to speak. It just makes you more nervous. Finish your slide deck early and practice with it. 8) Sitting Down to Deliver Your Presentation: The moment that you sit down and start clicking slides, the PowerPoint deck becomes the authority in the room on the topic and your energy will plummet. Stand between your screen and the audience, and you will be the expert. 9) Read… Click… Read… Click…: If you are doing this one, then I hate to be the one to tell you this, but… You’re Boring! Sorry. I know that hurt, but it’s true. The good news is that if you follow the prior guidelines, this one goes away automatically. So if you are experiencing this, go back and work on the earlier tips. 10) Letting Someone Else Design your Slideshow: Realize that if someone else designs your PowerPoint Slide Deck, it will likely have many of the earlier mistakes in it. You’ll also have a more difficult time delivering it and be more nervous. To combat this, you’ll need to practice your delivery a lot more than if you designed your own presentation, but it can be done. Over time, use the guidelines above to influence the person or people who are designing your slideshow. Follow these simple guidelines, and your PowerPoint Slides will help you better deliver more powerful presentations. Violate them, and you’ll likely be more nervous and have a more difficult time delivering your presentation. Doug Staneart is the creator of The Fearless Presentations® Public Speaking Class that is offered in major cities all over the United States, Canada, and Europe. Click the link here (http://www.leadersinstitute.com/public-speaking/fearlesspresentations.html) and request information about his presentation course, and he’ll send you a free copy of his book, Fearless Presentations®. His new program, the Entrepreneur Boot Camp, helps small business owners grow their businesses during difficult financial times like a recession.